It’s 3am. I just heard a series of loud beeps coming from my neighbor’s apartment as he screamed, “Come on! Goddamnit!” Then, complete silence. What the hell is going on in there? 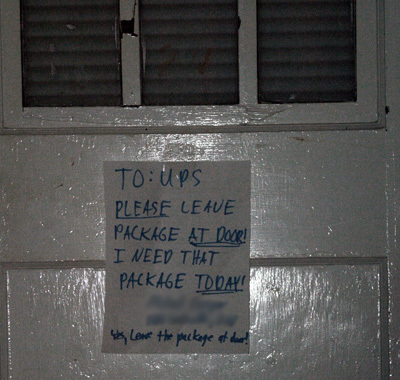 My neighbor accross the hall tapes this friendly note to UPS to his door every time he’s expecting a package. The blurred out part is his name and address, as if the delivery person didn’t already have this information.